What is the process for getting Invisalign? How does Invisalign compare to traditional braces? What issues can be corrected? Are there foods or beverages to avoid while wearing the aligners? How many hours per day are Invisalign aligners worn? How long will a retainer be worn after Invisalign? The bottom line: is Invisalign worth it? The Invisalign system straightens teeth in just one year, using clear plastic aligner trays. Although they can be removed, ideally the aligner trays should be worn for at least 22 hours per day. Invisalign represents an alternative to traditional braces and can help correct many common dental issues. The Invisalign system was first made available in 2000, and offers a comfortable and practical way to straighten teeth. Plastic aligners move the teeth in carefully preordained sequences through gentle and continuous push forces — a process also known as sequential aligner therapy. These clear trays fit over the teeth and are custom made from smooth BPA-free plastic. They are designed to loosen teeth slightly in their current position and track them toward their new position. Speech is unaffected by the aligners. Each set of aligners lasts approximately two weeks before being replaced by the next set in the series, gradually advancing dental realignment. Depending on the situation, some aligner trays will be used longer. Patients with crowded teeth may benefit from “stripping” between the teeth edges to gain more space before they begin treatment. Stripping narrows the teeth by trimming a small quantity of tooth enamel from selected teeth. The first step is to find an Invisalign provider—dentists and orthodontists who have undergone specialized training in the Invisalign system. Providers can achieve “preferred,” “premier,” or “premier elite” status, based on the number of patients they have treated. Your Invisalign provider will assess your teeth, jaw, and facial structure. A scanner will capture a 3D image of your teeth, and in some cases, X-rays will be taken. If you are a good candidate, your orthodontist or dentist will develop a personalized treatment plan based on the initial position of your teeth and the projected final end result. You will then be informed about length of treatment and follow-up evaluations. You will also be given an image so that you may envision the final results. The total duration of treatment depends on the complexity of each individual situation. One determining factor is the degree to which the lead tooth—the most poorly positioned tooth—needs to be moved either in terms of distance or in terms of rotation. That said, treatment typically lasts between 9 and 18 months—a slightly shorter treatment period than traditional braces. This is because Invisalign is simply better suited to less complex orthodontics. On average, treatment takes 12 months. Invisalign treats such common issues as overbites (the upper front teeth overlap with the lower front teeth) and underbites (the lower teeth protrude past the top front teeth). It also corrects spacing issue due to missing teeth or gaps between teeth. The degree of success in correcting these issues rests in part on the expertise of the specialist administering the treatment. In the hands of an experienced Invisalign treatment provider, smiles can be dramatically improved. There are, however, some limitations that govern the extent to which Invisalign can correct dental irregularities. Complex cases such as severe overbites will respond better with traditional braces—for example, if the misalignment is due to the jaw, not the teeth. Dentists and orthodontists will present patients with the available options and limitations of these different orthodontic treatments. 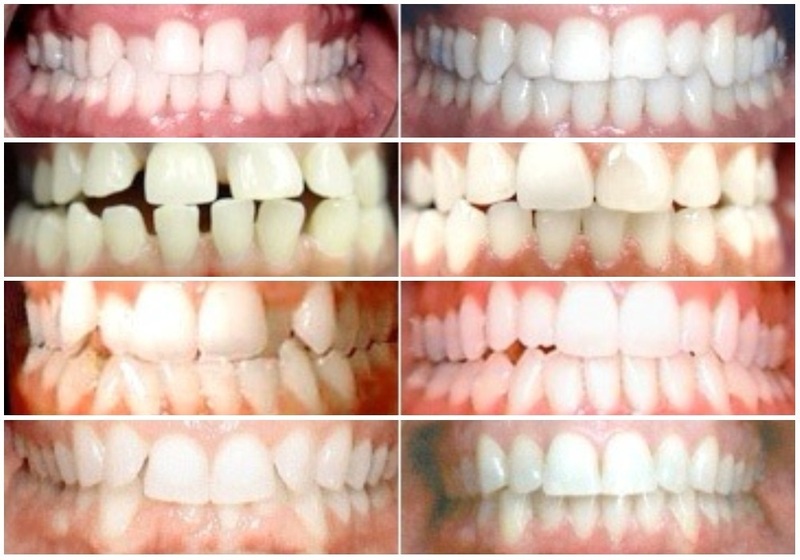 The before and after images below show examples of results achieved with Invisalign for crossbite, gapped teeth, crowding, and overbite. Since the Invisalign aligners must be removed when you eat and drink—apart from drinking water—there are no restrictions. Avoid chewing gum while wearing the aligners, as they can adhere to them. It is essential to brush and floss your teeth after each meal to prevent staining and tooth decay, and keep the aligners clean. You should aim to wear your aligners all the time, except when you are eating or drinking, brushing or flossing your teeth. Invisalign works on the principle that constant, gradual pressure applied to your teeth will incrementally shift them toward a new position in your mouth. Most dentists and orthodontists encourage patients to wear their trays for at least 21–22 hours per day. The longer you leave the trays in, the quicker the results. If you have a day where you wear the aligners an hour less than usual, you can make up for it the next day. However, if you consistently wear the trays less than recommended, this will negatively affect your final results. It is important that you talk to your dentist or orthodontist and are honest about how long you will realistically wear the trays each day. They will design a personalized schedule to allow your teeth realignment to succeed. Invisalign usually costs slightly more than regular braces, ranging from $3,500–$8,000, depending on the extent of the alignment and number of aligner trays required throughout treatment. For many people, the benefits of being able to remove aligners to eat and brush the teeth often outweigh the slightly higher price. Your dentist or orthodontist will be able to give you a more accurate estimate of the financial investment required after taking X-rays and images of your teeth. If you have dental insurance, Invisalign treatment is generally covered in the same way that traditional braces are covered. If you have concerns about the cost of financial investment, there are options available to help make the treatment more affordable—many Invisalign providers offer flexible monthly plans. Dentists may also offer financing through CareCredit, a system specially designed for healthcare expenses. » CareCredit is a third-party patient financing program that enables you to get the procedures you want or need. Click here to find out more about CareCredit. Wearing a retainer is a lifelong commitment and will ensure you preserve the beautiful results gained from the Invisalign treatment. It is critical to wear a retainer after Invisalign, following the recommendations of your dentist or orthodontist. Retainers may be worn full-time for up to 22 hours a day for several months to maintain the position of your teeth once your treatment is completed. In many cases, the last aligner will serve as a temporary retainer until a more permanent retention option is determined. After the initial retention period, your dentist may permit you to wear your retainer less frequently during the day—and eventually—at night only. Overall, Invisalign offers a subtle and efficient way to correct common issues as gapped teeth, overbites and underbites. More than 1,000,000 patients worldwide have chosen Invisalign to help improve their smile. A recent North American survey reported that 96% of patients were happy with the results of their treatment, with 9 out of 10 stating that they would recommend Invisalign to their friends and family. If you would like to improve the aesthetics of your smile, Invisalign can help you achieve straight and beautiful teeth with its customized, almost invisible, system. Talk to an experienced provider to find out if Invisalign is right for you.